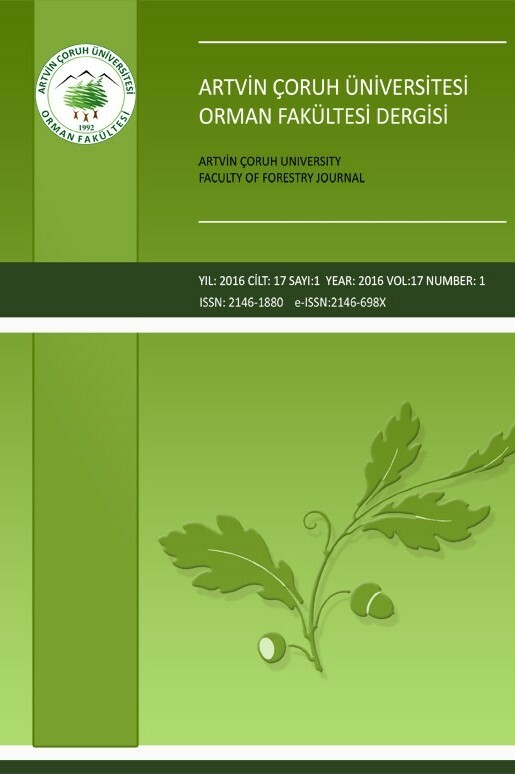 Artvin Coruh University Journal of Forestry Faculty publishes original research articles, reviews, technical notes and scientific news in all aspects of forestry, wood science, landscape architecture and related fields in two issues per year. All manuscripts submitted to the Journal are subject to independent referee evaluation. Submission of manuscript to the Journal implies that it has not been published or is not being considered for publication elsewhere. Manuscripts should be written in 12 pt “Times New Roman” with 1.5 space between lines and not exceed 18 pages including all text, tables and figures. A-4 size paper should be used with 3 cm top and left margins and 2.5 cm bottom and right margins. All pages and lines must be numbered consequently. Manuscipt language should be Turkish or English. Title page: Title of the manuscript (in manuscript language), full names (without titles) and affiliations of all authors should be given. Complete contact information (mailing address, e-mail, and telephone and fax numbers) of the corresponding author should be provided. Abstract page: This page includes manuscript title, abstract (100-250 words) and key words (maximum six words) in manuscript language. Same information should be given in the other language below. The title of the paper should be short, precise and written without any abbreviations. Main text: Main text includes (i) introduction, (ii) material and methods,(iii) results (and discussion), (iv) discussion (and conclusion), (v) acknowledgements sections. Headings should be upper case and bold type. Sub-headings sould be lower case and bold. Language should be as clear and as concise as possible. Figures and tables should be numbered consequently and be embedded in the text at appropriate places. Figure titles should be placed below each figure and table titles should be placed on top of each table. Table and figure captions should be self explanatory but concise. Scientific names of subject organisms should be provided where they first appear in the text if their common names are to be employed in the text. International SI unit system should be followed and decimals should be separated with ‘.’ not with ‘,’ (e.g., 45.7 % or 0.221). References: All references listed at the end of the manuscript should be cited in the text, or vice versa. References should be cited within text with author’s last name and publication year in parenthesis (e.g. (Scotti 2011); if there are two authors (Kraj and Sztorc 2009); if more than two authors (Çengel et al. 2011)). If more than one citations will be given in a parenthesis, they should be ordered according to their publication dates from oldest to newest separated with ‘;’. If used in a sentence only the publication year should be in parenthesis (e.g., ‘According to Steffenrem et al. (2007) wood properties of Picea abies …’). Manuscripts are first evaluated by the editor. Manuscripts that are out of Journal’s scope and do not meet scientific criteria with respect to content and presentation are returned to authors without review. Editor assigns at least two referrees for manuscripts with potential to be published in the Journal. Editorial board can accept the manuscript as it stands or with revisions according to referree suggestions, or rejects the manuscript for publication. Revisions must be completed as soon as possible. The proofs are sent to the corresponding author after acceptance and it should be checked for printing mistakes and returned to the editor within 24 hours. A copyright release form, signed by all authors, must be filed with the editor before the proofs are sent.